Add2Psu is an interesting product that allows you to easily and safely connect and use two computer power supplies together when just one PSU is not powerful enough for your needs. The Add2Psu product was created by David Lorentzen after he found that the standard PSU (Power Supply Unit) configuration in his home server was not meeting his needs. It was not originally designed for use with crypto currency mining rigs, but it has turned quite popular solution for connecting multiple power supplies for such. Power users don’t usually need to go for such product when using two or more power supplies as they know what and how to connect things to make them work. Still Add2Psu makes things very easy for users, both not so advanced and advanced ones without having them rely on some sort of a DIY solution. If you still haven’t looked into the product, then you might want to give it a try should you need to connect two or even more power supplies together to make them work powering a single system. 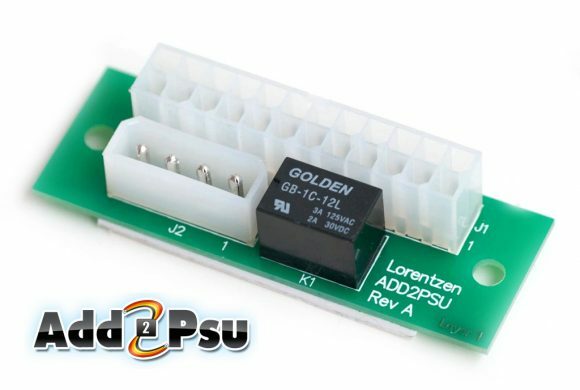 Besides Add2Psu, there is also a different version called Add2Psu-D and it is essentially the same adapter, but with the option to set a custom delay for shutting off the second power supply. This delayed shutdown for the slave PSU may not have much use for crypto mining rigs or ASIC miners, but it could still be helpful in some specific computer setups. Note that there are many non-official Add2Psu adapters available as well, some of which are very cheap clones that you might want to stay away from as they can actually cause trouble and not help resolve ones.